In Ayurveda Marmas are mentioned. Susruta Samhita deals with Marmas elaborately. 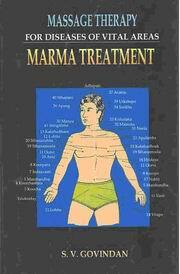 Those who practise Ayurvedic Massage should have the general knowledge about Marmas. Now-a-days the Acharyas of Kalari Payattu (Martial Aart) know the Marmas and the Marma treatment. By massage Marmas are protected and also activated. Some diseases can be treated or controlled by activating the Marmas. There are 19 Marmas which are damaged. The prognosis is sudden death due to diminution of fire of the body. So those Marmas should be well protected. Vishalyaghna Marmas (3) are also very difficult to treat if anything is stuck on those points because by removing the foreign matter from the body the wound causes the air to escape and the contact with the Marma is lost.In olden days the Ayurvedic doctors had the knowledge of some Marma poionts where they used to press and the patient became unconscioius and the surgery was done. After the operation another Marma point was pressed and the patient regained his consciousness. If any Marma is damaged the body gets some trouble. If Marmas are well activated some diseases can be cured it is well mentioned in this book.